We are always trying to connect local riders, provide information, and share opportunities for visitors to find ride routes. Although we realize Strava is not for everyone, it is a great platform to connect with other riders, discover routes, and challenge each other. Join the club and connect. The hills of Manchester. 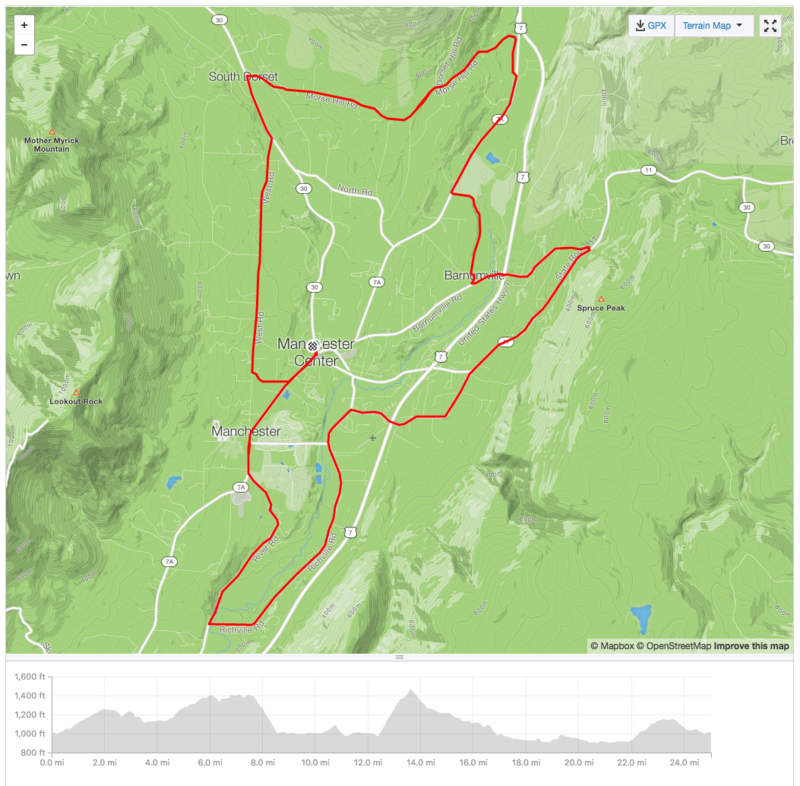 Last August I rode this route with John Sohikian in advance of his 4-day cycling event, The Vermont Challenge, in the Manchester/Stratton area. This 25-mile route has some nice hills to test your legs and sticks close to Manchester, so if at any point you are ready for lunch, just head to town. The Chiselville Bridge Ride in our most popular ride from casual riders renting a bike to the day to our Thursday Night Road Ride group. The ride will take you through the Chiselville Covered Bridge East Arlington along the beautiful Sunderland Hill Road and River Road. The ride finishes by taking you past the Historic Equinox Hotel. The Humphrey’s Mountain Bike Trail is located at the west end of Church Street at the intersection of the Dorset West Road. The trail was built by Northshire Trail Systems, who continue to maintain and build more single track mountain bike trails in our area. Park at the Dorset Green on Church Street just off of Rt. 30 in Dorset Vt. Grab something to eat and drink at the Dorset Union Store – Sorry no bathroom here – then head west along Church Street for 3/10th of a mile to the intersection of the Dorset West Road. Go left (south) for about 150′ and look right and see our trail head. 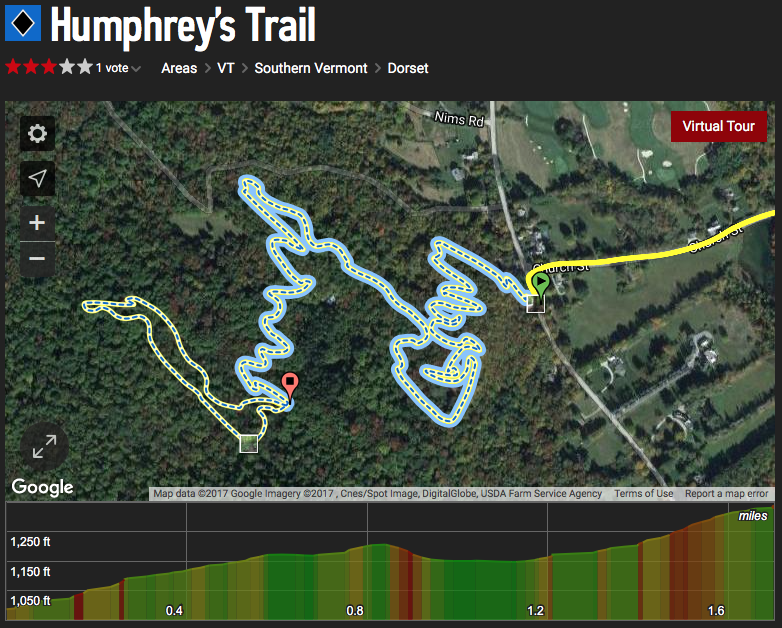 The Dorset Trails include two trails – the entry trail Humphreys, which winds up the hill about 2.5 miles and then branches off onto the Bunker loop, which adds another 7/10th of a mile, and reconnects to to Humphreys trail. After a ride be sure to visit the Dorset Inn, Dorset Rising Bakery, H.N. Williams Store or Barrows House, for great food and beer. Fast Paced on difficult terrain. Distance 30-50 miles. Pace lines may form. For riders with experience, in top condition and looking for an emphasis on conditioning. Ride leader could be anywhere in the group. If you have any doubts, try a B+ ride first. Same as A, but slightly slower. No Drops Policy – Regroup at major hills and intersections. No Sweep. More chit-chat. Riders will have solo riding experience but may be new to group riding. Terrain and speed more moderate. Distance 15-25 miles. Ride leader may give advice to those not accustomed to riding in groups. No Drops Policy – No one gets dropped. Ride leader sweeps. Relaxed cruise. Ideal for a beginner. Distance 10-15 miles. Terrain as flat as possible (not an easy feat in Ridgefield!). Pace is slow, ride leader helpful in guiding new riders and giving pointers. Fast paced on mostly difficult singletrack. Distance 10-20 miles. For riders with experience, in top condition and looking for an emphasis on conditioning. Race-like pace. Manmade or natural trail obstacles will likely be encountered, but can be ridden around. Ride leader could be anywhere in the group. If you have any doubts, try a B+ ride first. No Drops Policy – At leader’s discretion. Riders may get dropped. Leader assumes all riders can and will safely find their way back to trailhead. Same as A, but slightly slower, and with more stops. Terrain includes technical singletrack with obstacles that may be avoided, although excellent bike handling skills are recommended in order to keep up with the group. No Drops Policy – Group will periodically wait to regroup when riders are dropped. If you find you’re in over your head, leader may give you directions back to trailhead at pace you can safely sustain. Emphasis on riding, but more social. Terrain a mix of technical singletrack and fireroads. Distance 7-10 miles. Riders should have experience on the trail and be an intermediate bike handler. Technical obstacles present, but can be avoided. No Drops Policy – No one gets dropped. Ride leader makes sure all riders follow route. Less technical singletrack and fireroad. Riders should have some experience riding offroad. Terrain and speed more moderate. Distance 5-7 miles. Ride leader may give advice to those not accustomed to riding technical aspects of trail. Mostly fireroad, with some short, mellow stretches of singletrack. Distance 3-5. Ideal for a beginner. Pace is slow, ride leader helpful in guiding new riders and giving pointers on mtb fundamentals.